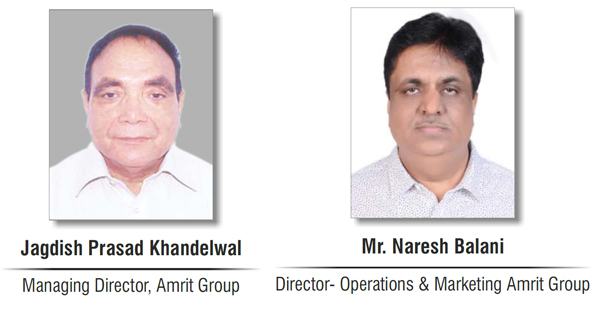 The Amrit Group established in 1984, owned by Mr.J.P.Khandelwal a qualified and highly experienced engineer is one of the most prestigious and dynamic company in manufacturing, importing and exporting of Diamond Studded Gold and Platinum Jewellery, processing and polishing of Diamonds from 0.50 CTS and above, and one of the Worlds leading manufacturers of Gold and Silver Refining Plants namely Amrit precious metal refiners and Gold assaying equipments. Mr. Naresh Balani, the driving force behind the company, has an industry experience of more than 30 years and has developed skills with some of the best names in the trade. AMRIT GROUP manages the most complex situation of jewellery, diamond trade and precious metal refining and assaying technology with a team of talented jewellers, technicians and engineers who strive to produce new designs each month thus ensuring continuous selection to suit the tastes and preferences of global consumers, besides creating jewellery and precious metal refiners for clients as per specifications. If you are looking for something unique and want a jewellery piece designed to your own specification and perfection then look no further, AMRIT GEM TECH PVT. LTD. team has years of experience in processing your design into Perfect Diamond Studded Gold or Platinum Jewellery. Our mission is to offer the jewellers across world a universe of high quality, hand-crafted, modern, traditional, designer and genuine Diamond studded Gold and Platinum Jewellery products at affordable prices to their personal tastes designed to their own specification and perfection. AMRIT GEM-TECH PVT. LTD. has been bringing the latest International technology for goldsmiths, to the global Gem & Jewellery industry. Their services in the highly specialised field of automatic chain manufacturing and investment casting are widely acknowledged. The AMRIT PRECIOUS METAL REFINER comes in various capacities from 1 kg. to 100 kg. of carat gold and silver scrap, filling, polishings, dust, workshop sweepings etc. Based on the internationally adopted method of refining, the AMRIT REFINER has incorporated further improvements to suit the refining needs of the jeweller and refiners all across the globe. With there own research and development facilities, indigenous manufacturing capability and service network, they provide proper training and prompt after-sales service, besides providing specialised consultancy for specific requirements of clients. 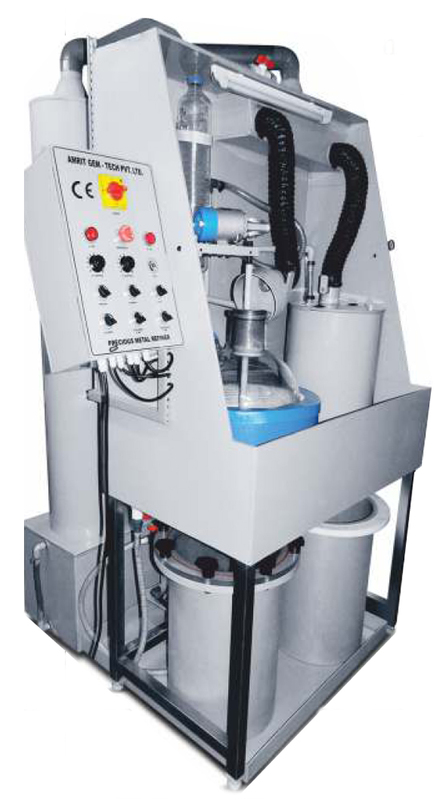 Training in operation of equipment and refining, provided at factory prior to despatch of the equipment, makes the AMRIT REFINER very easy to use. The step by step instruction manual and DVD, which comes with the system, provides further guidance. All chemicals and consumables are readily available in respective local markets. With the AMRIT REFINER, you can obtain fine gold, silver and all precious metel form carat gold scrap, filings, polishings, dust, workshop sweepings Dorè Bar etc., in your own premises, under your total control, in very short time, this results in substantial savings, due to low operational cost and complete recovery, without paying to outside refiners. Precious metal are fully recovered in powder form, ready for melting. Hazardous fumes and odours are neutralized before being discharged into the atmosphere, maintaining a clean, healthy working environment. • Unit complete with fume cabinet & S. S. stand. • Fume scrubber with inbuilt Three Phase/ Single Phase blower. • Tank with motor for re-circulation of water. • Hazardous fumes and odours, neutralized through gas treatment system. • Specially Designed filter barrel for quick filtration. Traps all solids, even from thick slurry. • Virtually 100% recovery. Very high purity can be achieved. (999 or more). • Can be used for Gold & Silver refining.